ENCINITAS — Keane Webre-Hayes can joke and smile about the morning hours of Sept. 29. But in the water of Beacon’s Beach on that morning, his life hung in the balance after being bitten by a great white shark. 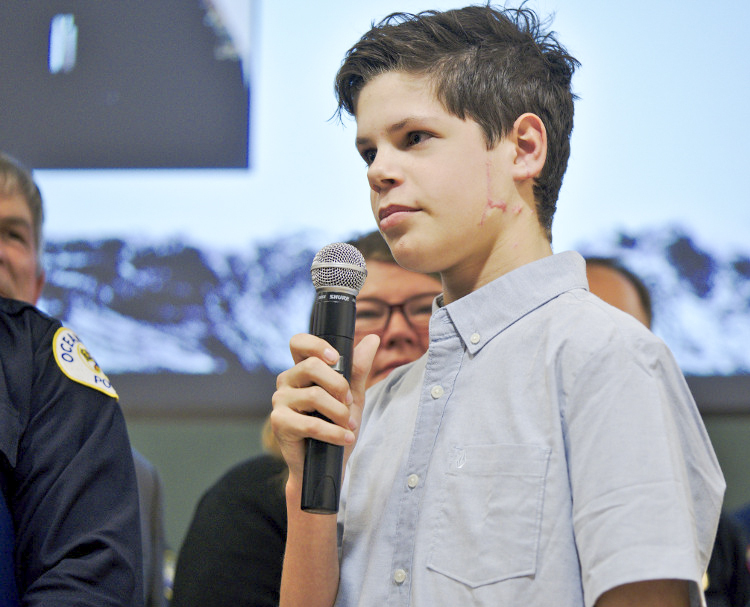 But thanks to the swift response of three Good Samaritans and first responders, the 13-year-old Encinitas boy is alive and headed toward recovery. 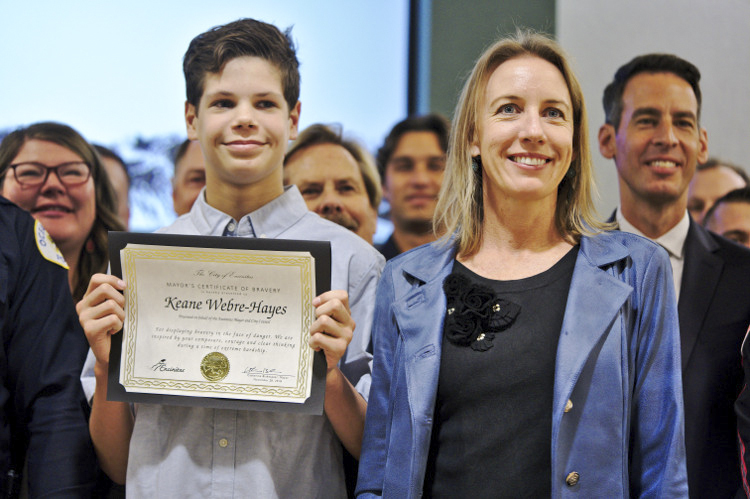 On Nov. 28, the city of Encinitas honored Keane and his rescuers with a proclamation for their bravery and life-saving efforts. The audience showered them with applause. Keane was referring to boat owner Chad Hammel, Oceanside Police Officer Matthew Ephron and off-duty lifeguard Andrew Helble, who happened to be in the water near Keane and his friends, who were lobster diving at the time of the incident, and brought Keane ashore where emergency response personnel went into action. Helble attended the proclamation remotely via a conference call. It was that swift action that kept the incident from being much worse, and highlights the very best of human nature, Mayor Catherine Blakespear said. One of the first responders on the beach was Matthew Chavez, a paramedic who responded to the scene. He described the experience with one word: lucky. Chavez said hearing Keane refer to him and the others on the scene as heroes means a lot to him. “We do our job every day and we never expect to hear things like that because it’s our job,” Chavez said. In addition to the first responders on the scene and the three kayakers, Keane thanked emergency personnel as a group for their selflessness. Keane said that physical therapy has gone well and he is regaining the ability to use his right arm. He hasn’t returned to the water, but not because of anything psychological. “I just haven’t regained full use of the arm yet, but I’ve been in the pool and am slowly working my way back to the ocean,” Keane said.